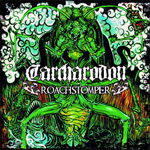 Carcharodon releases its second full-length album. Roachstomper collected eleven new original Southern stoner metal and death'n'roll tracks. You can buy this album as a CD from Altsphere, Amazon, CDuniverse,..
You can now listen to the full album at Deezer or at Spotify. This is perfect mosh-pit/head-banging material to rock out to. And you can’t get any better that. Great music, few beers and hanging out with your friends. (...) After multiple listens, I am very fond of this album and I rate it very highly. And you will to if you decide to check out the world of the mighty Carcharodon . Highly Recommended.